The last time my husband and I ventured to Paris, I spent hours pouring over more than 100 restaurant reviews, meticulously highlighting passages and taking notes in an attempt to suss out the city’s prime local eats. The neighborhood joints we discovered were indeed spectacular, but sometimes I forget that we have just the type of hideaway I hunt down when traveling right here in Canton — Jack’s Bistro. It’s a cozy, neighborhood gem with a kitchen that consistently turns out both innovative dishes and those that feel like old friends. In the mood for fun and playful? Take a bite of their 100% ground bacon burger. That’s right, it’s an all-out baconfest for pig lovers. No beef between those buns. Searching for some comfort? 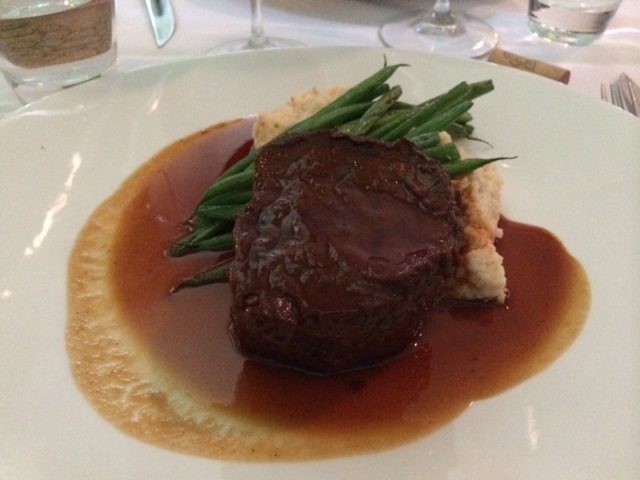 Go for the Guinness-braised filet mignon. This is my personal favorite menu staple and it’s perfect every time. The meltingly-tender beef, the velvety sauce, the smoky bacon grits — it’s an entirely lick-worthy plate, something I have been known to do on occasion. Have a hankering for some exotic funk? There are several options on the ever-changing menu for those with adventurous palates. The spicy Somboon mussels offer an incredible tangle of Asian flavors with fresh herbs, sour citrus, pungent fish sauce and a hit of heat. These plump morsels are not to be missed. It’s hard not to order this appetizer over and over again. Of course, when you repeat, you forgo an opportunity to try something new on the menu, a dilemma my husband and I both often face at Jack’s. It’s a good problem to have. Mussels or a fresh cucumber ribbon salad? Grilled kale with apricots or chocolate mac and cheese? My favorite steak or duck cassoulet? Or those chewy ramen noodles in a heady broth? It’s always an internal tug of war. On a recent visit, the Guinness filet won the entree battle, but I did manage to venture over to the dessert menu and sample something new — durian fruit creme brulee. I love that this kitchen even gets kooky with dessert. I was too intrigued to pass this one up. It was durian fruit afterall, the southeast Asian fruit that some say emits a stench so vile it’s been compared to festering raw sewage, among other choice aromas. I so needed to sample this exotic treat. There was a touch of barnyard on the nose, but otherwise it was mild, slightly sweet, with a hint of nuts and a whiff of onion in the mix. I do give the kitchen points for creativity, but the flavor profile wasn’t what I look for in a dessert. Durian fruit aside, the creme brulee itself was absolutely luscious. 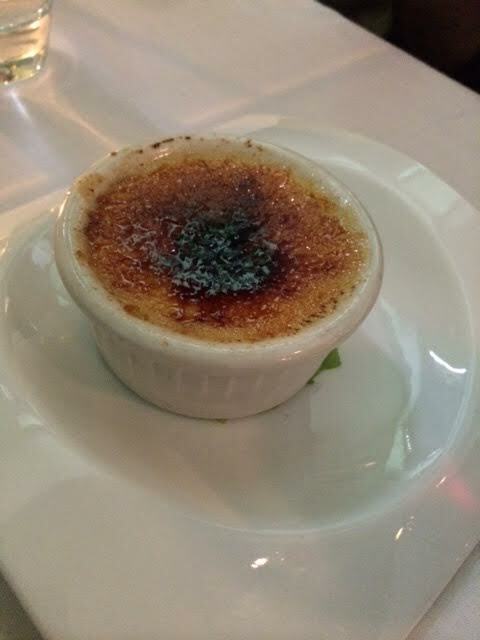 If they ever put a traditional creme brulee on the menu, my waistline is in real trouble. I don’t know how much longer the dessert will be available, but if you’ve ever had the desire to try this peculiar fruit, don’t miss your chance. I suggest you hightail it on over before it disappears. Although on my most recent visit I devoured my go-to steak, I am eager to return as I now have my eye on new menu items. I look forward to soon slurping up the Malaysian coconut-milk curry and tasting whatever creation my husband chooses. And that, quite simply, is the beauty of Jack’s. The kitchen seduces you with its pure comfort food and consistently lures you back with intriguing menu surprises. It’s bold. It’s delicate. It’s downright wacky sometimes. I am so lucky this bistro is in my neighborhood. And if you live in Baltimore, so are you. This entry was posted in Baltimore Restaurants. Bookmark the permalink. Very nice. Is this your first column? agreed! and we are lucky to have such great friends with whom to share it!